This just made my day when I saw it. These pictures, depicting the life of Christ were actually done to promote the Easter pageant at the Mesa Arizona temple. It became such an phenomena that it is now a traveling exhibit. We are hoping to see the actual exhibit of these pictures this week at the Joseph Smith Memorial Building in Salt Lake. I hope you enjoy! O.K. I am a terrible blogger. I take time to read other people's blogs, but I just never seem to update my own. I always have grandiose plans, but I always think "I'll do that later". Things have been awfully busy around here lately. Lecsi is busy working at the salon and Sephora. Nate has been off track and will go back to school on Monday. 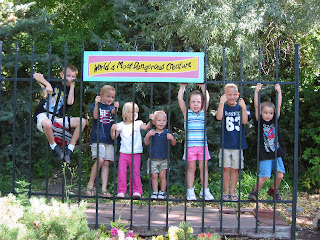 Mason is in the full swing of preschool. I have already taught for 2 weeks and will teach again the week after next. Steve has been on a business trip to Atlanta and will be going again the same week I teach preschool. I hate the shorter days that come with Fall, but maybe it will give us a chance to slow down a little. 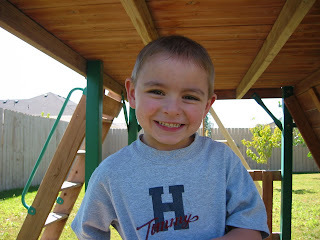 Here's my cutie pie on the first day of school. Doesn't he look happy and grown up? 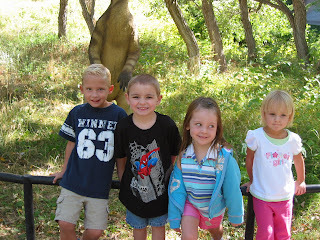 Here's Mason on our school field trip to Dinosaur Park. 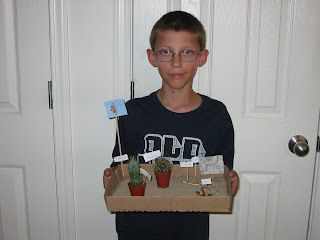 Nate and his awesome science project on the desert. He did a great job. Way to go Nate! Another field trip picture. Did you notice my boys trying to actually scale the bars. They definitely can't be held in captivity, not even for a picture.